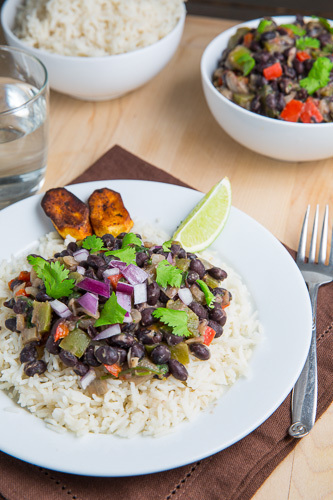 A tasty Cuban style black beans and rice that is good as a side dish or a meatless main. Heat the oil in a pan over medium-high heat, add the onion and pepper and cook until tender, about 7-10 minutes. Add the beans and water, bring to a boil, reduce the heat and simmer for 10 minutes. Season with salt and pepper to taste, mix in the vinegar and cilantro, optionally mash 1/4 of the beans to make it creamy and served over steamed rice.